The pictures in this packet are PORTRAITS. This packet lends itself well to a comparison of different ARTISTIC STYLES. REALISM and EXPRESSIONISM are the two different types of artistic presentation represented here. Discuss REALISIM versus EXPRESSIONISM. The paintings by William H. Johnson and Amedeo Modigliani are examples of expressionism. In this type of presentation, the artist wants to express emotions or demonstrate feelings. The natural appearance of these portraits are distorted or exaggerated—they don’t look REAL, as in nature or a photograph. The artists are not worried about how realistic the paintings look, only how they communicate a feeling or atmosphere (MOOD). 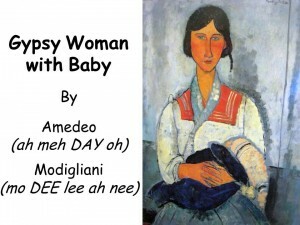 Amedeo Modigliani and William H. Johnson have each painted in a STYLE that appears to be “untrained”. This STYLE of painting is often called FOLK ART or PRIMITIVE ART. Both of these artists were greatly influenced by the art of primitive African masks. Compare the STYLES of all of the Portraits. How are they similar? How are they different from each other? Which Style of portraiture do you prefer? Is there just one “right” way to paint a portrait? Why might an artist want to paint a portrait that exaggerates the truth instead of one that appears as real as a photograph? Be sure ALL 5 pictures are returned to the Packet Carrier after your Presentation is finished. 1.”Li’l Sis” by William H. Johnson (1944). 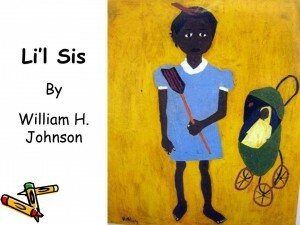 William H. Johnson was an African-American painter who received his formal training at the New York Academy of Design. Early in his career, he worked in a style inspired by the great modern European painters, such as Vincent van Gogh. After a 1932 visit to Africa, where he explored his ancestral legacy, Johnson developed what he called a “primitive” style of painting to express his feelings about the black experience. He then turned to memories of his own childhood, in the rural South, for subjects. This painting is very simple. Johnson used only six colors. What six COLORS can you see here? Red, yellow, blue, green, brown, and white. Li’l Sis is not shown in a house or outside in a yard. In fact, there is no background at all. Li’l Sis is just there. The darker and brighter colors seem to come towards us while the yellow (with lightest color value) recedes, or moves away from us, to become the background. The artist made the girl and doll carriage in expressive but simple SHAPES set against this empty background. He painted only a few details—the girl’s finger and toenails and her hair ribbon—in a graphic, almost childlike style. Johnson created a playful image. “Primitive” usually refers to a painter without formal training. Johnson actually had formal training at the New York Academy of Design. Why would he choose to paint in a style like this? This artist chose to paint in this simple style because it reminded him of the style of art that the primitive African tribes used in their art when he had visited Africa. Johnson did not always paint this way, only when the pictures referred to something from the artist’s own African ancestry. It was a way the artist chose to respect to his Black heritage. The young girl in this painting is Li’l Sis, Johnson’s niece. Her dress is plain and she wears no shoes. She watches after the baby in her doll-carriage. Johnson painted Li’l Sis with one of her favorite toys, a flyswatter. What could it mean? The objects included in portraits often reveal important things about a person—their likes, dislikes, lifestyle, social status, etc. If you were going to have your picture painted, what would you want to be shown holding? What would it tell others about you? • Write a story about Li’l Sis. Include details about what her life is like and what she does each day. 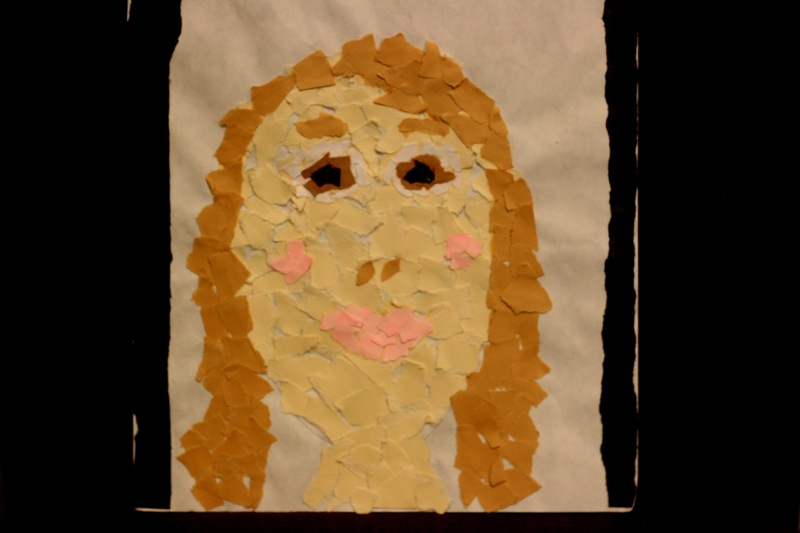 • Use construction paper, in the three primary colors and the three secondary colors, to create a cut paper portrait of a child. It should resemble Johnson’s style. Include a toy with the child. Use a LIGHT VALUE paper (like yellow or pale blue) for the background (so it seems farther away) and glue your cut paper child to this. White and one other Neutral color may also be used for details or skin, but not the main picture or background. Use colors with brighter and darker colors for the child and the toy(s) so they come forward. Use only cut paper for everything in the picture. Eyes, fingernails, wheels can be drawn, but cut and glued details will make the picture much more artistic. The finished project will look much like the STYLE of this painting. • Create a simple painting of a child, in the style of Johnson. The child should hold or play with a toy. Paint the background with a LIGHT VALUE COLOR (so it moves backwards) and leave it plain like this picture. 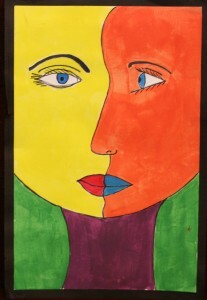 • Paint a self-portrait using only the six PRIMARY and SECONDARY colors. Try to make it simple and EXPRESSIONISTIC, like this portrait. William Henry Johnson was born March 18, 1901, in rural Florence, South Carolina. Because he was the oldest child in the family, William had to work odd jobs while he was in school to support his mother and four younger siblings. He often missed a lot of school days because he had to earn money to help feed the family. William moved to New York City, from Florence, in 1918, at the age of 17, to pursue a career as a newspaper cartoonist. William settled in New York at the dawn of the Harlem Renaissance, a period of literary and artistic activity among blacks, which centered in New York City’s Harlem area. At that time, Harlem was the center of African-American music, dance and art. The Harlem Renaissance lasted for about 10 years, before the stock market crash of 1929 marked its end. Johnson became an important part of the Harlem Renaissance movement. By 1921, Johnson was admitted to New York’s National Academy of Design. At the Academy, Professor Charles W. Hawthorne guided the talented young man and provided him with employment to pay for his art studies. Johnson also worked in an artist’s studio in exchange for painting lessons. His talent was recognized as having tremendous potential. William Johnson was encouraged to study art in Europe, and in 1926, he sailed for Paris to begin. After nearly two years in France, William returned to the United States and to his childhood home in Florence, South Carolina. Using his friends and family as models, Johnson began to paint the everyday activities of the people he knew who lived in Florence. William then returned to France, after his visit home to the United States, and was married. The couple then moved to Denmark and Johnson painted many landscapes while he lived there. As a black man, William Johnson experienced much less racial prejudice while living in Europe than he had in the United States. In Europe, William’s work was taken more seriously than it had been in America. He and his wife, who was also an artist, traveled and lived all over Europe. In 1938, William and his wife moved back to America because of the threat of the Nazis and another World War. The couple settled in New York and William was once again able to “paint his own people”. Johnson got a teaching job at the Harlem Community Arts Center, through the government sponsored Works Progress Administration (WPA) program, in New York. This was a government program that helped artists earn money for their art, although the economy was not good. The American government paid artists a small amount to paint or a sculpt work of art each month. The paintings that Johnson began producing then concentrated on African-American subjects and were painted in a style that looked like American Folk Art or the work of a “Primitive” painter. William Johnson was actually a professionally trained artist who had been professionally schooled in the techniques of Fine Art. Johnson chose to paint in this simple, primitive style, so that these paintings would more effectively illustrate the stories of his simple and colorful cultural heritage. Unfortunately, Johnson’s wife became sick and died, in 1943. He sadly left New York and returned home to South Carolina. There he once again painted many of his family members in his familiar primitive style. But William wasn’t happy anymore. The death of his wife was very hard for him. He eventually returned to New York but ended up suffering a terrible mental breakdown. William stopped painting after 1949 and died in 1970. 2. “Don Manuel Osorio De Zuniga” by Francisco de Goya (1784). Francisco de Goya y Lucientes’s passionate desire for success propelled him along a difficult journey. 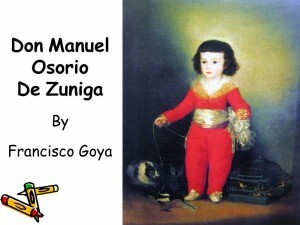 Born in the poor, isolated village of Fuendetodos, Spain, in 1746, Goya learned his craft as an apprentice artist in the city of Zaragoza, Spain. He moved to Madrid, in 1763, where he struggled to make ends meet. In Madrid, Francisco took part in the competition for admission to the Royal Academy of Fine Arts of San Fernando. After several rejections, Goya was finally accepted, in 1789, as a painter to King Charles III, of Spain. Teaching at the Royal Academy, Goya made contact with noble families who commissioned him for Portraits and Murals (large wall paintings). 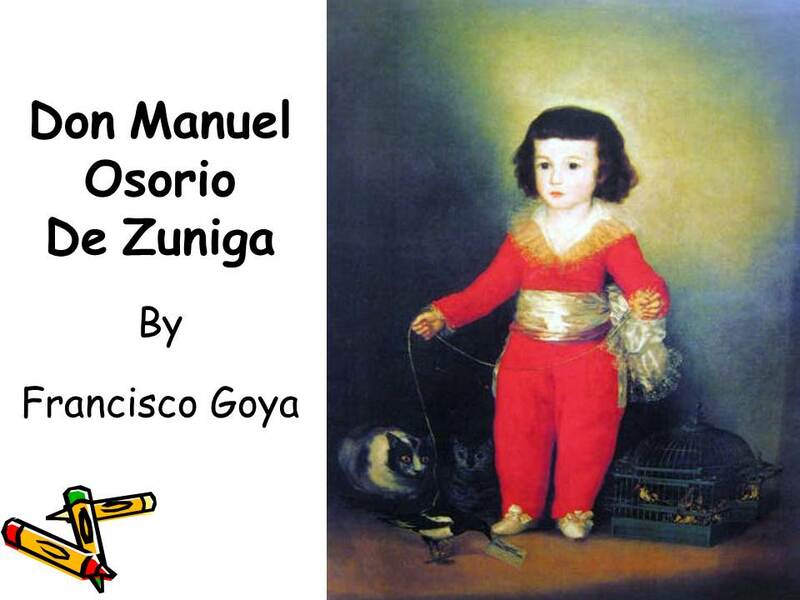 Francisco Goya liked children. He often portrayed children in his paintings, with great care and tenderness. Goya had five children by his wife, Josepfa. Only one of them, Javier (ah vee air), grew to adulthood. He then had only one grandchild. In the 1700’-1800s, children often died of diseases that are common today, such as ear infections or strep throat. There were no antibiotics yet to cure these diseases. In this portrait of the Count of Altamira’s son, we see Goya’s masterly command of contrasting colors, textures and light. Goya painted Don Manuel’s fashionable red suit in broad strokes with almost no shadows or details. In contrast, the white lace collar and satin sash glow with light, transparency and delicately painted details. Goya emphasized the boy’s rosy skin tone through the contrasting gray-green background. Goya displays his gift for telling a powerful story through the use of symbols that were readily understood in his time. Standing alone in an empty room, the boy is surrounded by pets that represent both good and evil. The three menacing cats are poised to pounce on the magpie. The magpie was seen as a Christian symbol of goodness in Goya’s time. The caged birds represent childhood. Goya created an air of mystery through the strong shadow on the right, which suggests an open door spilling light onto the boy. He leaves the viewer with an unanswered question—What does the boy see on the other side of the door? Goya arranged this painting to make it seem as though the boy is in control of his pets. Things are pretty calm in this picture right now. In a way, Goya left this painting unfinished. He set up the scene, but left it up to you to imagine what is about to happen. Do you think the boy is REALLY in control of his pets? Why or why not? What do you think is going to happen? The boy really isn’t in control, because just behind him, his three cats stare wide-eyed at the bird. You know that in a minute, this calm scene will turn into chaos. • Draw or paint a picture showing what will happen next in this picture. • Have kids draw a picture of themselves with their pet(s). • Have kids write a story that explains this picture. The story should identify the boy, tell what happened before this scene, include an explanation of this scene and have a conclusion. It could also include other characters. Tell them that this painting illustrates the middle of their story and kids should write a beginning, middle and ending to explain this painting. Have them illustrate either the introduction or the ending of their own story. 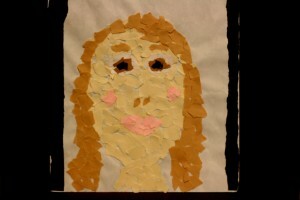 • Have kids create a torn paper portrait with their pet. They could also do a cut paper picture with their pet. If some kids don’t own a pet, they can create a picture with an animal they would WISH for a pet. Amedeo studied art in Florence and then went to Paris. He lived a very reckless life and died from the effects of living this way, at the age of only 36. He was, however, noted by his fellow artists for being well trained and talented, with a very outgoing personality. Modigliani did portrait paintings, sculpture and drawings. His style is all his own and is characterized by strong, long, oval shapes and lines. He painted 75 portraits and only 5 landscapes in his short life. Look closely at this woman and you’ll see that nothing about her seems real. Her face is too oval, her neck and body are much too long, and her fingers are a jumbled zigzag. Notice how flat she looks. 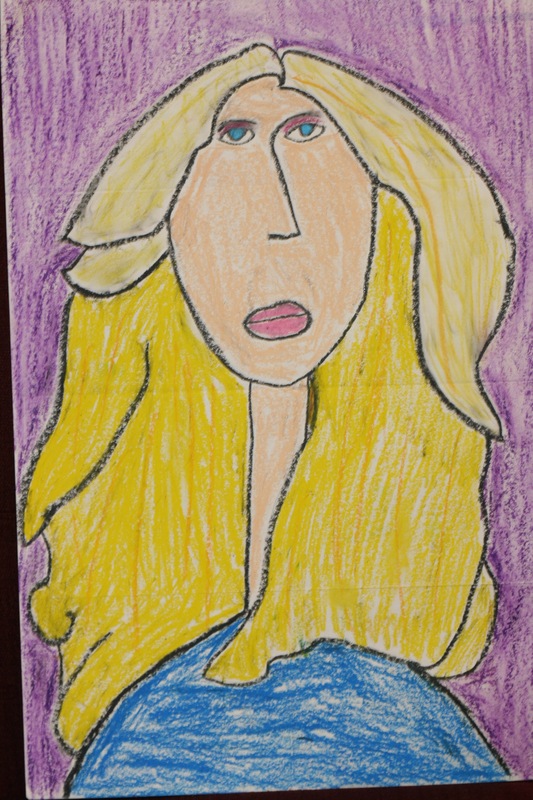 What artistic STYLE did this artist use, REALISM or EXPRESSIONISM? EXPRESSIONISM, the artist didn’t paint her to look natural, like a photograph. The artist painted her in his own unique way. Although the woman in this portrait is drawn with distorted lines, she is still very human. Modigliani developed this style from studying African art. 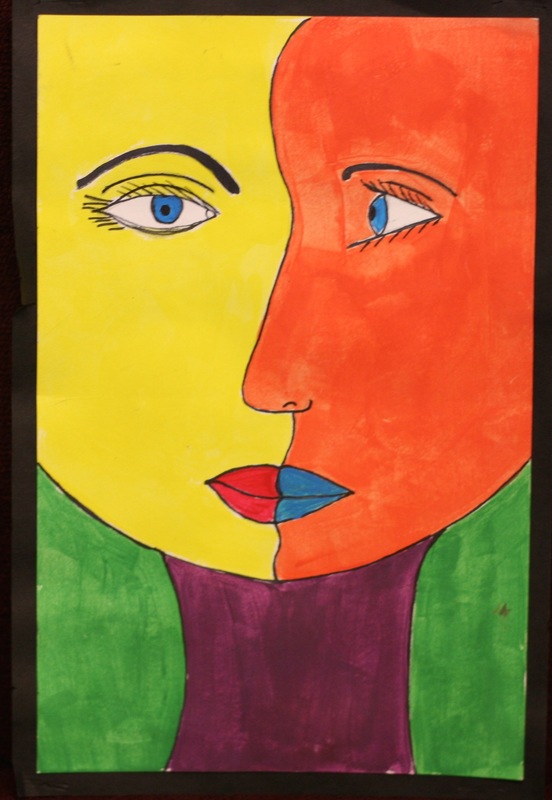 Using simple lines and shapes, the artist was able to paint a portrait that catches our interest. The gypsy mother’s long, narrow body—and especially her face and neck—make her seem elegant and regal. Although she is seated, the woman looks as if she is standing. Our only clues are the slight flaring of her skirt, where her bent knees would be, and part of a chair poking up above her right shoulder. Modigliani painted many portraits in this simple, primitive style. Oval heads, big, almond shaped eyes, and tiny mouths are features of almost all of his works. Yet each painting is different from the others. Each captures something personal about the subject. • Cut portraits of mothers and babies/children in magazines. Glue several of these portraits into a collage. Add small drawings of things associated with mothers and babies/children: bottle, car seats, rattle, stroller, diapers, hearts, cookies, cake, purse, lipstick, etc. to the collage. Cut out letters to spell words in the collage such as: love, mom, baby, kindness, care, help, gentle, special, family, children, kids, play, fun, games, happiness, goodness, etc. 4. 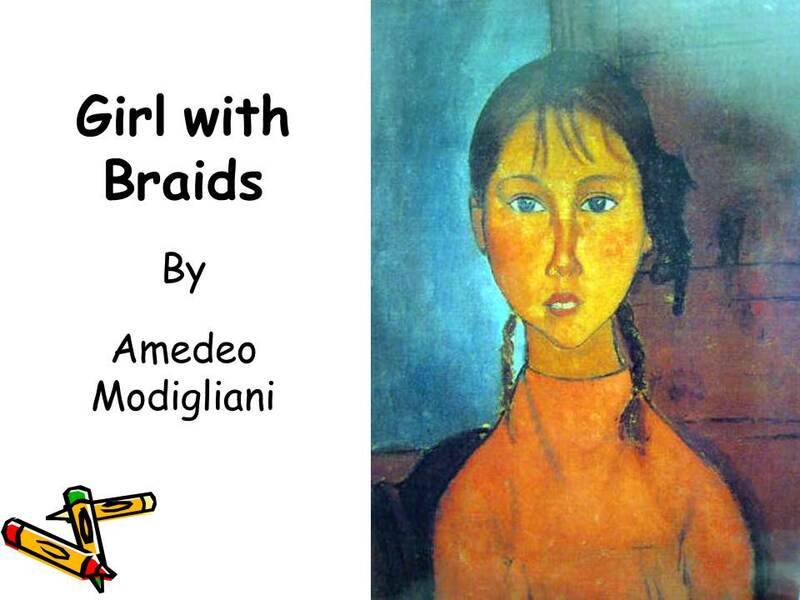 “Girl with Braids” by Amedeo Modigliani (ah-meh-DAY-oh mo-DEE-lee-ah-nee), 1918. Is there anything else that seems interesting or unique about this portrait? The girl’s nose appears much longer than normal. The mouth is much smaller in comparison to the eyes. Through vertical shapes and the vertical format of the canvas, Modigliani accentuated the elongated figure. The artist reinforced the clarity of line and shape by selecting contrasting colors: red and green, black and white. A range of warm red tones—in the face, the shirt, and the background—focuses our attention on the girl’s green eyes. To convey a sense of depth, Modigliani applied a translucent (see through) area of white behind the girl. Like Gypsy Woman with Baby, we can see a chair behind the girl’s left shoulder. How do you think the girl in this portrait is feeling? What is the MOOD of the painting? Does she look sad? Why or Why not? What do you think this girl is thinking about? Challenge kids to come up with creative and unique answers. There are no WRONG answers to this question, only opinions. How did the artist trick our eyes to focus on the girl, or in other words, the FOCAL POINT? What is the EMPHASIS of the picture? Where do our eyes go first? The viewer’s eyes are attracted to the WARM RED colors of the girl and her dress first, she also fills in most of the center of the picture. 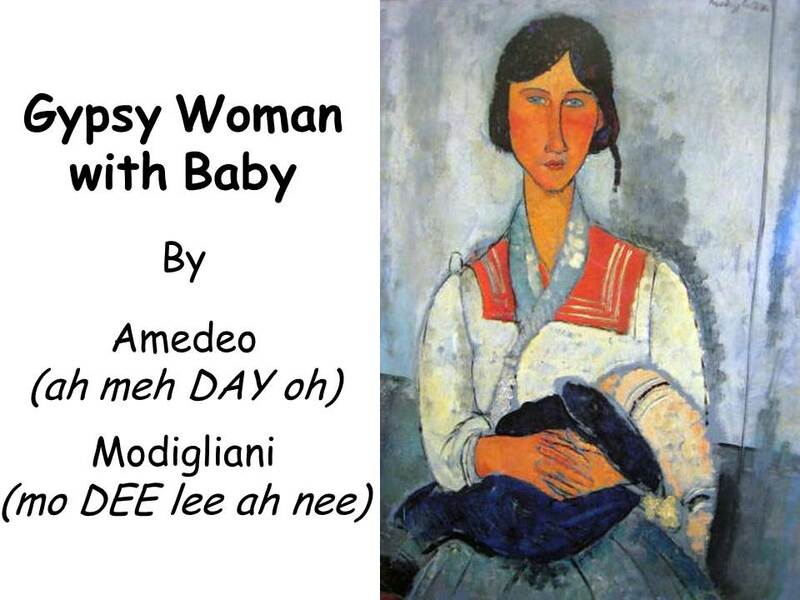 Compare the hairstyle of the girl in this portrait with the mother in Gypsy Woman with Baby. This girl has two braids. The gypsy woman also has a braid. 5. 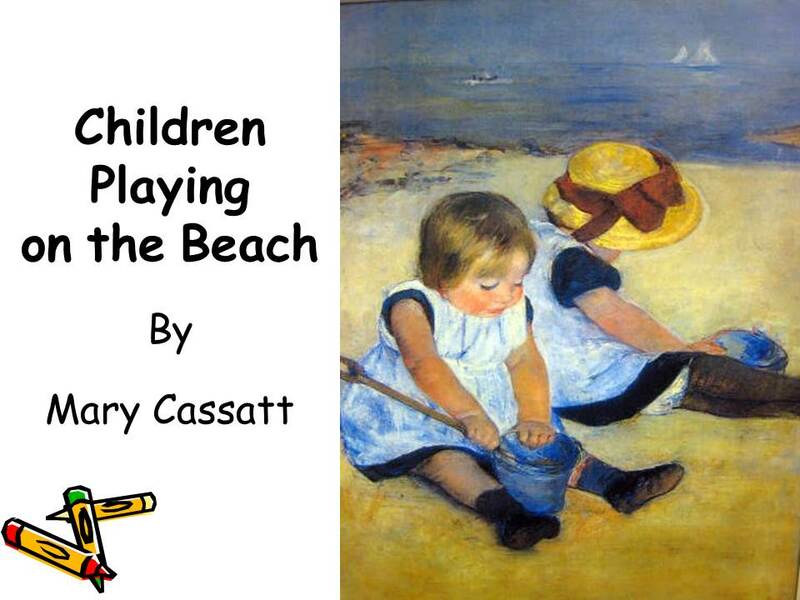 “Children Playing on the Beach” by Mary Cassatt (1884). Mary Cassatt was born in Allegheny, Pennsylvania, on May 22, 1844. She was the daughter of a well-to-do Pittsburgh business man. Mary studied Art at the Pennsylvania Academy of Fine Arts, in Philadelphia. She is known as a great American artist, although she spent most of her life living and painting in France. Mary met the French artist Edgar Degas (DAY gah), in 1877. Degas became a close friend and his art and ideas had a strong influence on her. Degas introduced Mary Cassatt to the Impressionists. Mary Cassatt never had children of her own, but she seemed to understand the love between mothers and their babies better than any other artist. She became known for her beautiful paintings of children and women. Mary regretted never having been a mother herself. This painting is alive with color and light. Although the painting looks spontaneous, it was carefully planned with many detailed drawings. How did the artist use REPETITION? Repeated angles, shapes and colors focus our attention on two toddlers absorbed in play. The dresses, silvery pails and the poses of the children are nearly identical. Cassatt captured the bright but shadowless quality of sunlight filtered through a hazy sky. 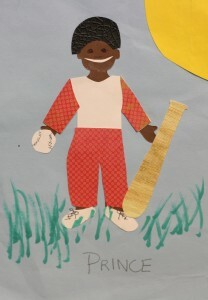 With strong or warm colors, she depicted the children’s sunburned faces and arms. Can you see another warm color? The yellow of the hat and the yellow-orange sand in the foreground. Highlights of thick white paint sparkle like reflected light on the pinafores. The toned down, or cool grays and blues in the distant ocean and sky make the figures seem brighter by contrast. How would you describe the TEXTURE of the girl’s clothing? The TEXTURE of the shoreline? 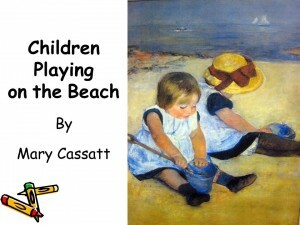 • Draw a picture of yourself with friends or family at the beach. Draw some beach toys in the picture. • Draw kids in the water splashing. Glue beach sand to the picture like glitter, to cover areas of sand. Mix together in an old pan and cook 5-10 minutes over medium heat, stirring constantly until very thick and dough holds its shape. Put on plate and cover with damp cloth until cool enough to handle. Knead well. Store tightly covered. Use like clay. Katie Bradley was born in Montana in 1981, and then moved to Germany as a little girl. She lived there until 2000, when she moved back to the USA to go to college. After finishing her degrees, she got married to Ben Bradley, and now has 2 sons and 1 daughter. She lives happily in Vancouver, WA with her family, and tries to spend a few hours every week painting. 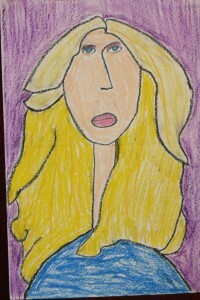 Although she has no formal training in art, Katie has been drawing and painting since she was a little girl. She was surrounded by creative family members, some of whom are published artists and illustrators. Drawing children has always been her passion, and she filled many sketchbooks and the margins of school notebooks with drawings over the years. Pencil or acrylic paints were originally her main media. In 2006, Katie discovered a love for watercolor painting, and has since painted many large and small watercolor paintings and portraits, several of which have won first and second place in juried art shows and exhibitions. Much of Katie’s art centers on multiethnic families and international adoption, as this represents her own family. Children are shown in everyday situations, sometimes looking at the viewer, or sometimes engrossed in their own little world. Some of Katie’s art is painted very realistically, while other pieces are more playful and illustrated looking. She allows pencil and pen lines to remain visible, and layers many different layers of transparent watercolor over each other, creating vibrant colors as well as depth. Katie generally doesn’t make separate sketches while planning a painting, but rather draws right onto the paper that will end up being the finished the painting from the beginning. Drawings are done free-hand, and if you look closely, you can see the pencil lines under the painting, because she chooses not to erase them. “MY doll!” – This painting shows two little girls playing dress-up. 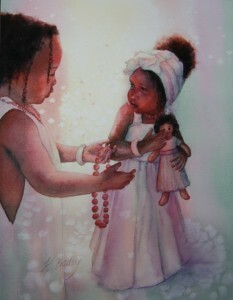 One girl is offering a necklace, which the other little girl clearly does NOT want to trade for her doll. The lighting in this painting is very high key, although the colors overall are warm, and soft. Students can have fun looking at this picture, figuring out what they think is happening here. Possible emphasis: line, dark and light contrast, creation of light by letting the white paper shine through. White fabric shows many different colors in light and shadow. Skin tones are created by layering many different colors under the actual final skin tone. Line helps emphasize details. 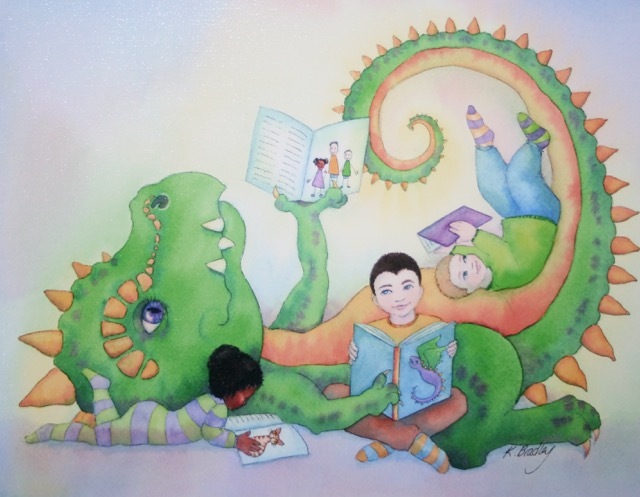 “Reading ferociously” – This painting is drawn in a more playful illustration style. It shows 3 children and a dragon reading books together. Line and color mainly creates this picture – shading is minimal. Repetition of designs (stripes) and color helps create a sense of balance. What kind of story do you think this painting tells? What is different about the two paintings by Katie? What is similar?